Eight and a half years after SpaceshipOne’s epochal 2004 Ansari X Prize-winning flight, its successor SpaceshipTwo (SS2) has completed its first powered test flight. The test, conducted by staff from Scaled Composites and Virgin Galactic, marks the start of the final phase of testing before the beginning of commercial suborbital service from Spaceport America in New Mexico. The test began at 7:02am PST when SS2 took off from Mojave Air and Space Port in Mojave, California mated to WhiteKnightTwo (WK2), its carrier aircraft. Piloting SS2 were Mark Stucky (pilot) and Mike Alsbury (co-pilot), test pilots for Scaled Composites, the firm founded by Burt Rutan that built SS2 for Virgin Galactic. Piloting WK2 was Virgin Galactic's Chief Pilot Dave Mackay, assisted by Clint Nichols (co-pilot) and Brian Maisler (flight test engineer) for Scaled Composites. 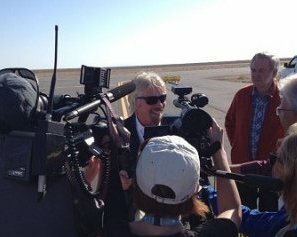 Sir Richard Branson (centre) surrounded by media and flanked by Burt Rutan at Mojave after the flight. Photo c/o W. Christine Choi. After climbing to an altitude of 47,000 feet (14.3 kilometres), at roughly the 45 minute mark, SS2 was released from WK2. The pilots triggered ignition of the rocket motor, and SS2 was propelled up towards a maximum altitude of 55,000 feet (16.7 kilometres). During the 16-second engine burn, SS2 went supersonic, achieving Mach 1.2. The entire test lasted just over 10 minutes, ending in a smooth landing at approximately 8am PST. 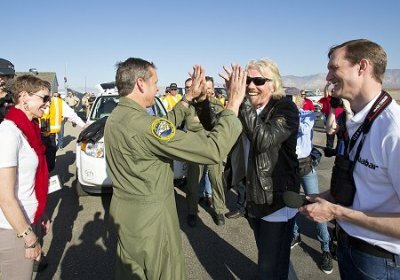 After touchdown, public statements were made by the heads of SpaceshipTwo’s two main financial backers; Sir Richard Branson, CEO of Virgin Galactic and His Excellency Khadem Al Qubaisi, Chairman of Aabar Investments PJC in Abu Dhabi. "The first powered flight of Virgin Spaceship Enterprise was without any doubt, our single most important flight test to date," said Branson, who was onsite at Mojave to witness the flight. "For the first time, we were able to prove the key components of the system, fully integrated and in flight. Today's supersonic success opens the way for a rapid expansion of the spaceship's powered flight envelope, with a very realistic goal of full space flight by the year's end. We saw history in the making today and I couldn't be more proud of everyone involved." "We partnered with Virgin Galactic several years ago with the aspiration to transform and commercialize access to space for the broader public," said Khadem Al Qubaisi. "Today's test is another key milestone in realizing that aspiration. Our partnership goes from strength to strength, and is an excellent example of aabar's desire to participate in the development of world class technologies that are commercially viable and strategically important, both for the company, its shareholders, and for Abu Dhabi." Virgin Galactic President & CEO (and former National Space Society director) George Whitesides also made a statement, "The rocket motor ignition went as planned, with the expected burn duration, good engine performance and solid vehicle handling qualities throughout," Whitesides said, adding that, "The successful outcome of this test marks a pivotal point for our program. We will now embark on a handful of similar powered flight tests, and then make our first test flight to space." SS2 pilot Mark Stucky being congratulated by Branson and Virgin Galactic President/ CEO George Whitesides (right). Photo c/o Mark Greenberg. Over the next few months, Virgin Galactic and Scaled Composites will conduct further flights. These next tests will steadily expand the spaceship's flight parameters, culminating in a full space flight anticipated before year’s end. In 2004, just after SpaceshipOne’s flight, Richard Branson promised the public commercial suborbital flights within three or four years. It ended up taking far longer, but Virgin Galactic and Scaled Composites’ patience and persistence are finally bearing fruit. SpaceshipTwo’s successful test flight has been a welcome milestone in a process that has at times been marked by frustration, tragedy, and controversy. On July 26, 2007, three Scaled Composites employees working onsite at the Mojave Air & Space Port were killed in an explosion during tests involving nitrous oxide (aka ‘laughing gas’) rocket propellant. A 2008 report issued by the California Division of Occupational Safety and Health (Cal-OSHA) failed to find a specific cause, concluding that the company had failed to provide its employees with proper training in the handling of nitrous oxide. Cal-OSHA fined Scaled Composites for five safety violations but took no further action, leading to allegations of influence-peddling by some space pundits. Despite the missteps along the way, today’s successful flight has put suborbital tourism back into the public consciousness. SpaceshipTwo’s success, though seen as a late promise by some, still holds the promise of better things to come. 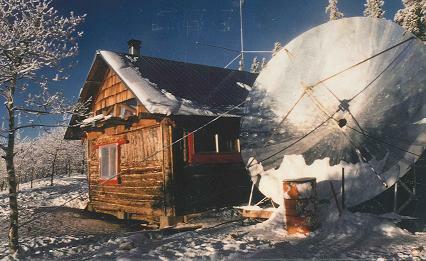 Canada's first private Earth station in Whitehorse, NWT in July 1977. Photo c/o the NORSAT history page. Following in the footsteps of BC based MacDonald Dettwiler (MDA), another Canadian space technology firm has been looking south for opportunities and growth in the face of Canadian space stagnation. As announced in an April 17th, 2013 press release under the title "Norsat Acquires US-Based Communications Business," on the company website, Richmond, BC-based Norsat International Inc., a provider of ground and satellite-based communications gear, has purchased the assets of a small (and as yet unnamed) US satellite telecom firm. 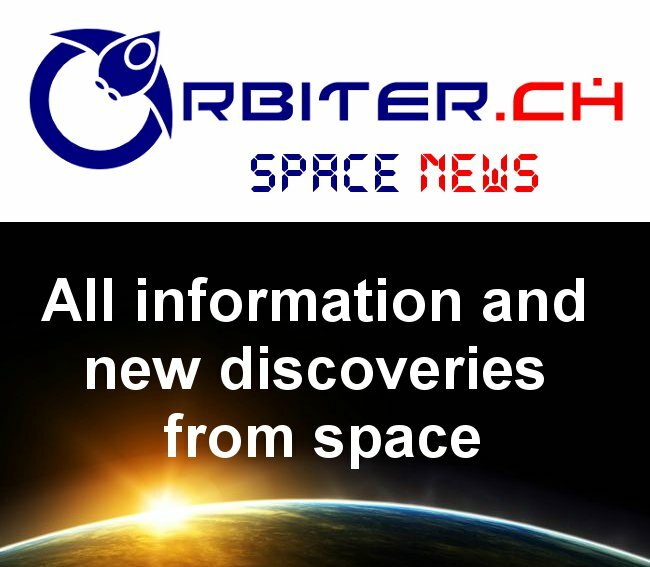 Norsat will pay $530,170 USD and will finance the transaction with cash from operations. The acquired assets include new products that will give Norsat access to new segments of the satellite communications market including solid state power amplifiers (SSPAs), high power block upconverters (BUCs), SATCOM baseband kits and micro-satellite terminals (terminals with antenna sizes below 1 metre). 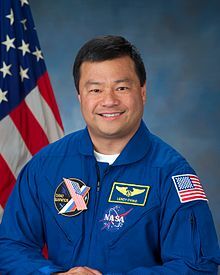 Current NORSAT CEO Amiee Chan is a notable satellite communications engineer who has worked on high-level NASA research projects such as the the NASA Advanced Communications Technology Satellite ( ACTS) terminal program. “Strategically, this acquisition is consistent with Norsat's ongoing growth strategy. Through it, we will broaden our portfolio of products and services, and the solutions we provide to customers. The expanded sales team and larger product range it brings will enable us to address new market opportunities in the US and around the world. Accordingly, we believe the acquisition will create strong value and has the potential to be accretive to shareholders,” said Dr. Amiee Chan, President and CEO of Norsat. In an earlier, April 8th, 2013 press release titled "Norsat introduces new microwave products for airborne and Ka multi-band applications," the company announced the introduction of new commercial off-the-shelf (COTS) and custom microwave products for airborne and Ka-band applications. These newly launched microwave products are used in satellite signal transmission and reception, and include block up/down converters (BUCs and BDCs), and low noise blockdownconverters (LNBs). Norsat demoed these new products at the recently concluded National Association of Broadcasters (NAB 2013) trade show in Las Vegas. The company was founded in 1977 as Northern Satellite Systems (NSS). Founder Rod Wheeler started the company with a then-innovative idea; to build the first affordable consumer satellite dish. From his cabin in Whitehorse, Yukon, Wheeler built a prototype satellite dish out of chicken wire and aluminum foil. This dish helped launch the company into the satellite market. Norsat’s current products and services include production and support of portable satellite terminals, microwave transmission gear, terrestrial microwave networks, antennas, radio frequency (RF) conditioning gear, maritime-based satellite terminals and remote network connectivity solutions. Through its Norsat Power Solutions subsidiary, Norsat also provides power conversion and energy storage solutions for the communications, transportation and resource sectors. Norsat’s recent moves highlight the continuing trend in the Canadian space sector towards concentration of resources and expansion into new markets. Along with its Richmond neighbor MDA, Norsat appears to be a part of a growing cluster of excellence wrapped around the Aerospace Technology Campus of the British Columbia Institute of Technology (also in Richmond). Norsat’s expansion into the US notwithstanding, it remains to be seen whether its joining a cluster of like-minded firms will spur growth at home. Expect more information to come out during the annual meeting of Norsat shareholders on May 8th, in Vancouver. ROM Director and CEO Janet Carding (right) presenting at the opening the 2013 Toronto Space Apps Challenge on April 19th. Just over 200 local potential space movers and shakers spent the weekend solving problems and building new applications for space derived data at the Royal Ontario Museum (ROM) as part of the 2013 International Space Apps Challenge and the only real unanswered question at the conclusion on Sunday was something which none of the participants could really address. Why weren't there more Canadian space organizations sponsoring and formally contributing? After all, as noted by "idea hacker" and "community builder" Heather Leson, who spent the weekend sending out tweets to promote the event, "these people are the people you'll want to hire." There were certainly individuals on hand over the weekend, "engineers who have worked on two Canadian robots, Canadarm2 and DEXTRE, currently deployed on the International Space Station (ISS)," according to the April 19th, 2013 Canadian Press article "Hackers of the world unite, this weekend," who assisted as mentors for the various teams. According to event sponsor B-Notions Chief Evangelist Greg Carron, the real secret to success for an event of this type wasn't just access to the raw NASA data. The real secret is access to the various NASA application programming interfaces (API's). These are libraries of software technical specifications which allow applications and data sets to communicate with each other. "The NASA API's are a challenge to developers," said Caron, because of their variety and the disparate nature of the tools they use. The TO based "Renewable Energy Explorer" team on Friday night. According to Victor Vucicevich (third from right), the intent was to build "a simple web application (which) tells you what type of renewable energy is the best option in terms of cost, future projections, output, and location." To see what they had to work with, check out Renewable Energy Explorer on the International Space Apps Challenge website. Of course, most of the attendees weren't all that concerned with the perceived difficulties. 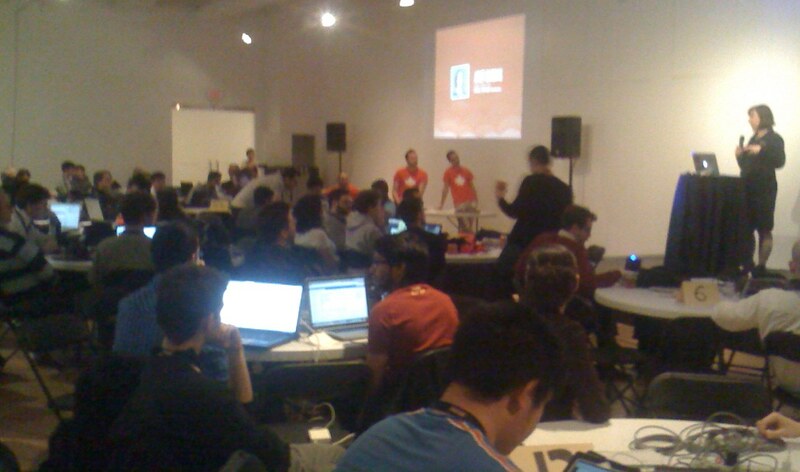 They wanted to build something useful and two Toronto teams were singled out for global judging, which suggests that they did something very useful indeed. Not just a local connection. 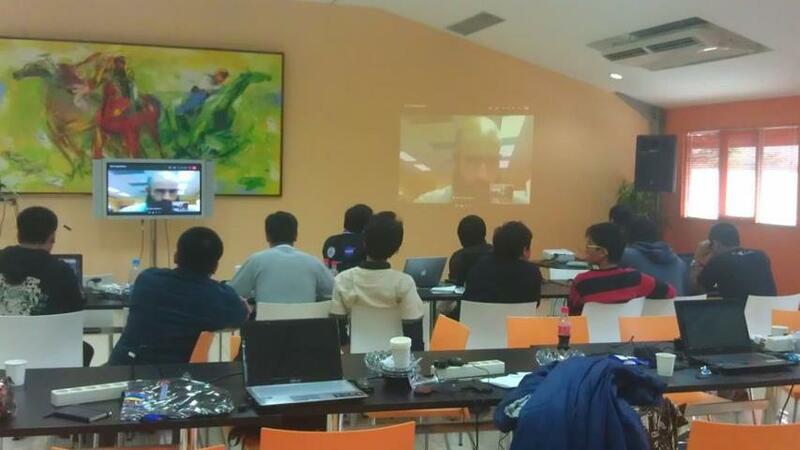 Space Apps Miami connecting to Space Apps Jakarta during the challenge. These are the Aurora Localization via Starfields project (a contestant in the Aligning the Stars challenge) and Museum of Intergalactic Species project (a contestant in the Adopt-a-Spacecraft: Voyager 1 challenge). As the only other Canadian city competing formally in this years event, Winnipeg participants also singled out two challenges to pass along for global judging. These were the Living on Mars project (a contestant in the Off The Grid challenge) and the ArdIMU V4 project (a contestant in the ArduSat challenge). Of course, Toronto and Winnipeg were competing against, co-operating with and contributing to dozens of challenges from 80 other locations around the world. It will be interesting to see both the final results of this years competition and whether or not Canadian organizations like the Canadian Space Agency (CSA) and others will take a more proactive role in next years event. Canada's Radarsat-1 satellite stopped communicating with Earth last month, and the country's oldest Earth observation satellite may be permanently lost. As outlined in the April 9th, 2013 CBC News article "Canada's oldest observation satellite hobbled in orbit" ground controllers last heard from the satellite on March 29th, when they noticed Radarsat-1 was in safe mode, a low-activity state in which the spacecraft conserves energy. But soon after that, the satellite went silent because the batteries ran out of power, and ground staff have been trying various recovery procedures ever since. Though Canadian Space Agency (CSA) officials haven’t given up on reviving Radarsat-1, the odds aren’t good. 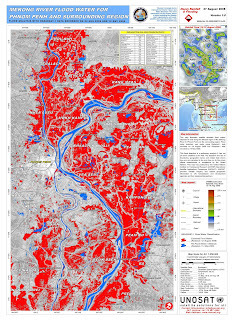 RADARSAT-1 image of the Mekong delta. "Make no mistake, this is a serious anomaly," said CSA flight operations manager Michel Doyon. "It is related to the power distribution system, so the chance of continuing a nominal mission is low, but we're still hoping to find a solution." As outlined in the April 9th, 2013 CSA press release "RADARSAT-1 Malfunction," the situation "does not impact the security of Canadian borders, coasts and northern territories as Radarsat-2 continues to provide critical, high-quality data. Government and commercial users of Radarsat-1 have been advised that no new orders for imagery are being accepted, but that requests for archival images will continue to be processed." Launched in 1995, Radarsat-1 operated for 12 years beyond its expected five-year lifespan; a testament to its designers’ skill. Radarsat-1 established Canada as a world leader in orbital synthetic aperture radar (SAR) imaging. Originally built by Ball Aerospace and Technologies Corp., and Spar Aerospace (purchased by MacDonald Dettwiler in 1999), Radarsat-1 is in an 800 km high sun-synchronous orbit covering the entire planet. In an April 9th, 2013 Canadian News Wire (CNW) press release titled "RADARSAT-1 status update," MDA external relations contact Wendy Keyser indicated that the impact of RADARSAT-1 not functioning "is not significant to MDA's business." 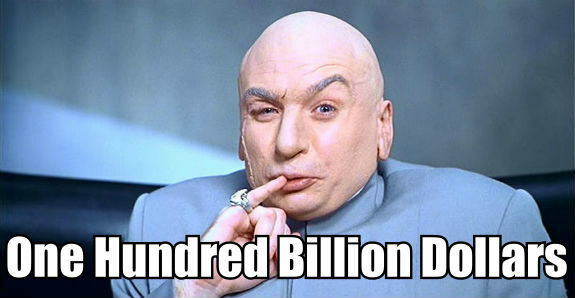 Radarsat 1's total cost was about $600 million, excluding launch costs, according to the CSA. 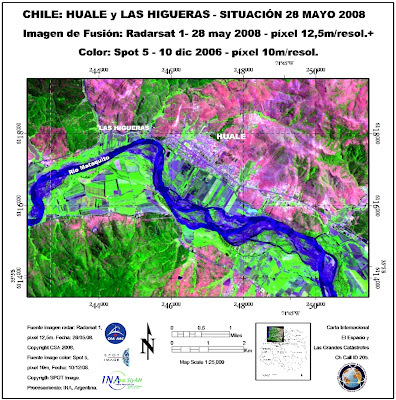 Radarsat 1 data was used in maritime surveillance, cartography, ice research, oceanography, agriculture, forestry and disaster management applications. Its C-band radar collected imagery of Earth's surface in day and night and in all weather conditions, creating images sharp enough to resolve objects as small as 8 meters. 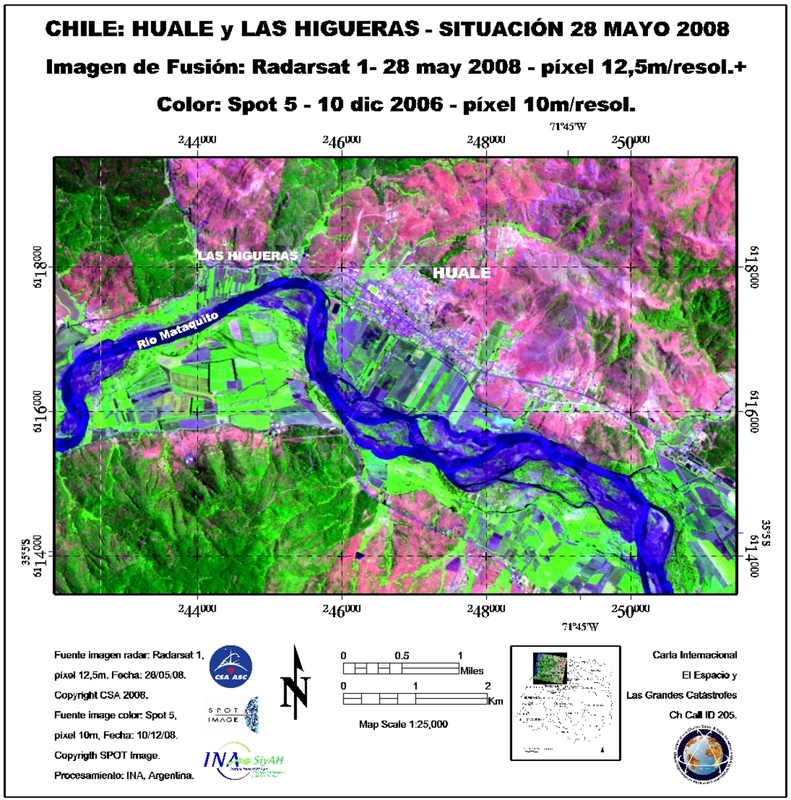 Composite RADARSAT-1 /SPOT-5 image from the International Charter: Space and Major Disasters website. Radarsat 1, which is owned and operated by the Government of Canada, Radarsat 2 is owned and operated by MacDonald Dettwiler (MDA) of Richmond, B.C. MDA has an agreement to supply data to the Canadian government throughout Radarsat 2’s lifetime in return for partial funding of the satellite's construction and launch. After the launch of Radarsat 2, Radarsat 1 took on a backup role to alleviate demand on the new satellite. 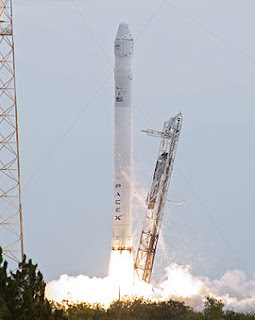 Radarsat 2 is designed to last until at least 2014. The CSA is developing a third-generation observation program called the Radarsat Constellation Mission (RCM), which will use a trio of satellites to gather imagery at a faster rate, covering Canadian territories at least once per day and up to four times daily in the Arctic. In January, the Canadian government signed a $706Mln CDN contract for MDA to build the three next-generation RCM satellites. These satellites are scheduled for launch in 2018. Another Canadian company, essentially unrecognized at home, has been singled out for praise by the international space community. 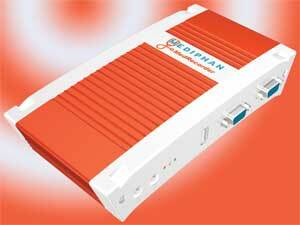 Mediphan, a division of Ottawa based Epiphan Systems, was inducted into the Space Technology Hall of Fame on April 11, 2013 during the 29th National Space Symposium in Colorado Springs, Colorado for the commercialization of medical technology originally developed by NASA aboard the International Space Station (ISS). According to the April 11th, 2013 Canada News Wire (CNW) press release "Epiphan Systems Inducted into the Space Technology Hall of Fame," the company was created "as a special unit to develop audio video capture, streaming, recording, and replay products and technologies for telemedicine and remote guidance applications." develop medical ultrasound remote diagnostic techniques for use by non-expert astronauts aboard the ISS. The goal was to create the basis for an operational telemedicine capability for future advanced space missions. 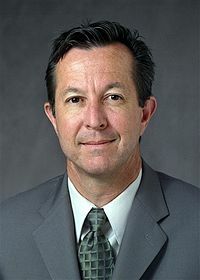 Beginning in 2003, Dulchavsky acted as principal investigator of the Advanced Diagnostic Ultrasound in Microgravity (ADUM) experiment, which was flown on the ISS and focused on astronauts conducting exams on one another to determine the accuracy and usability of ultrasound tools to diagnose injuries, illnesses and in-flight bone alterations. During these experiments, Dulchavsky’s team was able to train astronauts without a medical background to use the remotely guided ADUM equipment in order to obtain a wide variety of diagnostic-quality medical images. Experts on the ground received these diagnostic-quality images from the ISS through satellite down link, which demonstrated the effectiveness of ultrasound as a multipurpose, remote diagnostic tool. Encouraged by their success, Dulchavsky’s team brought aboard others at Henry Ford Hospital, plus Wyle Laboratories and Epiphan to commercialize and resell the developed technology. The key to the commercialization process was the development of cost-effective, technologically viable methods for sending ultrasound scans over long distances on Earth without loss of image quality, which was Epiphan's area of expertise. Eventually, the required skill-set was rolled into a new company (Mediphan), which then hired marketing experts and sales people to target satellite clinics, remotely located care facilities, traveling sports teams, medical residents, military units and other places where remote diagnosis of medical issues by non-medical personal is likely to be required. While Mediphan and the Johnson Space Center (which managed the initial ADUM experiments) shared the spotlight as the inducted organizations, the award also cited Dr. Dulchavsky, Epiphan Systems CEO Mike Sandler and NASA astronaut Dr. Leroy Chiao (who supervised many of the ADUM experiments as ISS expedition 10 commander from October 9th, 2004 – April 24th, 2005). Wyle Laboratories was also cited for "organizational commendations." While Canadians should certainly be pleased that Canadian companies continue to enjoy favored status in this area, it's odd to note that Canadian companies might also be perceived of as being better at commercializing US products than domestic inventions. Private sector space activity is seeing unprecedented growth while government space is on the downswing, says a comprehensive new report. On April 2nd, the Space Foundation, a U.S.-based advocacy and research group, released its 3rd annual Space Report, as part of the lead up to the 29th National Space Symposium, being held in Colorado Springs, CO from April 8th - 11th. 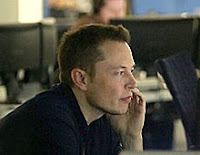 The report was created in conjunction with aerospace consulting firm Futron Corporation to research and analyze government and industry trends in global space activity and includes a stock market analysis from ISDR Consulting LLC, a firm specializing in the space and technology sectors. The global space economy grew to $304.31 billion in commercial revenue and government budgets in 2012, reflecting growth of 6.7 percent from the 2011 total of $285.33 billion. 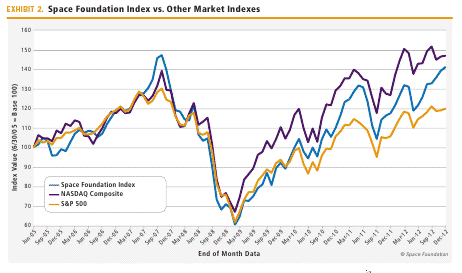 Commercial activity, space products and services and commercial infrastructure, drove much of this increase. From 2007 through 2012, the total has grown by 37 percent. Commercial space products and services revenue increased 6.5 percent since 2011, and commercial infrastructure and support industries increased by 11 percent. Government spending increased by 1.3 percent in 2012, although changes varied significantly from country to country, with India, Russia and Brazil increasing budgets by more than 20 percent, while other nations, including several in Europe, experienced declines of 25 percent or more. The global space economy grew by nearly 7% in 2012, reaching a new record of $304.31 billion. As in previous years, the vast majority of this growth was in the commercial sector, which now constitutes nearly three-quarters of the space economy, with government spending making up the rest. Commercial space products and services such as broadcasting, communications, and Earth observation made up the largest portion of the space economy, growing by 6.5% in 2012. 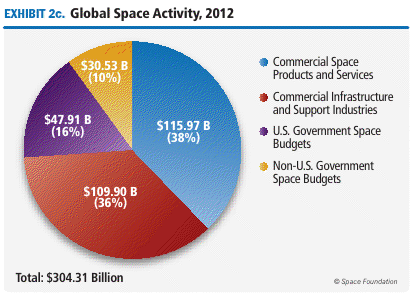 The commercial space industry has sustained a healthy growth rate, far surpassing increases in government spending. Wealthy individuals and private equity firms have stepped up to show their interest in the space sector by investing in existing firms and starting new ones. If government austerity measures continue to reduce funding for national and international space programs, commercial interests will likely play an even larger role in the coming years. In addition to the known benefits of space activity, this wave of commercial activity could potentially generate unexpected benefits that reward early-stage participants. Overall government investment in space saw negligible growth in 2012, increasing by slightly more than 1% from 2011 levels. This growth was not evenly distributed—some countries decreased their budgets as projects ended and others increased their budgets and announced new initiatives for the years ahead. The U.S. space budget remains the largest single segment of global government spending, although it grew by only 1.4% in 2012. By contrast, several smaller programs received sizable increases—budgets grew by 27% in Brazil, 30% in Russia, and 51% in India. Other countries, such as Canada and Italy, decreased their levels of investment in space during the year. Within the space sector, mergers and acquisitions remain a useful tool for companies to position themselves for anticipated changes in government spending. In the United States, the size of the space workforce decreased by 4% from 2010 to 2011 (the most recent data available from the U.S. Bureau of Labor Statistics). 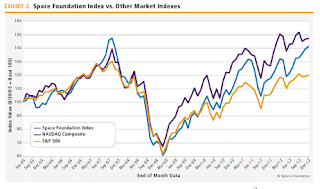 This was the largest single-year decline in the previous decade and it continued a five-year downward trend that began in 2006. The end of the Space Shuttle Program in 2011 was a major factor, causing the loss of more than 7,000 jobs in Florida alone. For those remaining in the space workforce, the news is somewhat better: U.S. space industry salaries have continued to grow, with the average space salary remaining more than double the average salary for the private sector as a whole. Elsewhere in the world, the space workforce is increasing, in some cases recovering from previous downturns. The European workforce has grown by 20% since 2006, returning to levels seen at the beginning of the decade. Japan’s space industry reached its highest level in the past 10 years, growing by more than 7% in 2011 alone. Economic conditions in some countries with developed space programs have led to budget restrictions, making it more difficult to develop and maintain space infrastructure. Space industry leaders are using different methods to overcome this challenge, such as improving cost management, pursuing more international partnerships, examining alternative hardware and flight formations, and harnessing commercial markets and practices. The data outlined in the 2013 Space Report points toward a fundamental shift in both culture and economics for the space sector. With the tide of government programs ebbing and that of the private sector growing stronger, greater incentives for innovation and collaboration exist than ever before. In the coming age, the risks of space will remain, but the rewards could prove even greater. 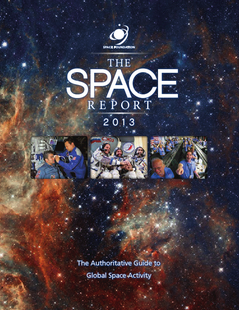 For a copy of The 2013 Space Report, please visit: http://www.spacefoundation.org/programs/research-and-analysis/space-report. Another writer has written another article on space based solar power (SBSP) focused on its history, the tens of millions of dollars already invested in the plan, the tens of billions more still needed to make a go of it and the perceived "giggle factor" arising from the inflated expectations and expansive hyperbole surrounding most discussions on this topic. The concept, delicious in its brashness, brings to mind an early James Bond flick: shoot big pieces of solar-panel arrays into space, assemble them in orbit into massive power plants that are miles wide, let the floating facilities collect space’s intense sunlight and convert it into electricity, and then beam that extraterrestrial juice—ray-gun-style—back down to an energy-hungry Earth. Of course, the article is in error. The real issues amusing SBSP skeptics are business and financial, not cultural. As outlined in the January 1st, 2013 blog post "Whatever Happened to Space Based Solar Power," lots of studies have been done in this area and they normally conclude that two specific sets of items must be dealt with before SBSP plans become commercially viable. First of all, SBSP is a money pit. Tens of billions of dollars (maybe as much as $100Bln US or more) are needed over a period of maybe 10 - 15 years before it's possible to even begin to build a system capable of generating commercially valuable amount of energy. What Dr. 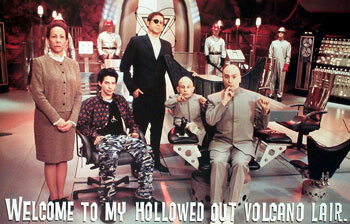 Evil hoped to raise during one of his monetarily challenged attempts to rule the world in the various Austin Powers movies. Accountants, evil geniuses and even governments generally acknowledge that $100Bln dollars is a lot of money just to generate cash flow. For comparison, it's worth noting that cash normally generates cash flow all by itself and immediately, just by being deposited into a savings account; a process which even allows the investor to retain access to the principal. And it's only after the initial billions of dollars of up-front costs are spent, that "massive" profits and commercial production becomes possible. SBSP studies generally agree this level of funding is the current minimum requirement to move forward with commercial operations. Unless, of course, the second set of problems associated with SBSP end up getting in the way. These are the dozen and a half decidedly non-trivial, undefined engineering issues which need to be dealt with before SBSP could become economically viable. An example of technical challenges. 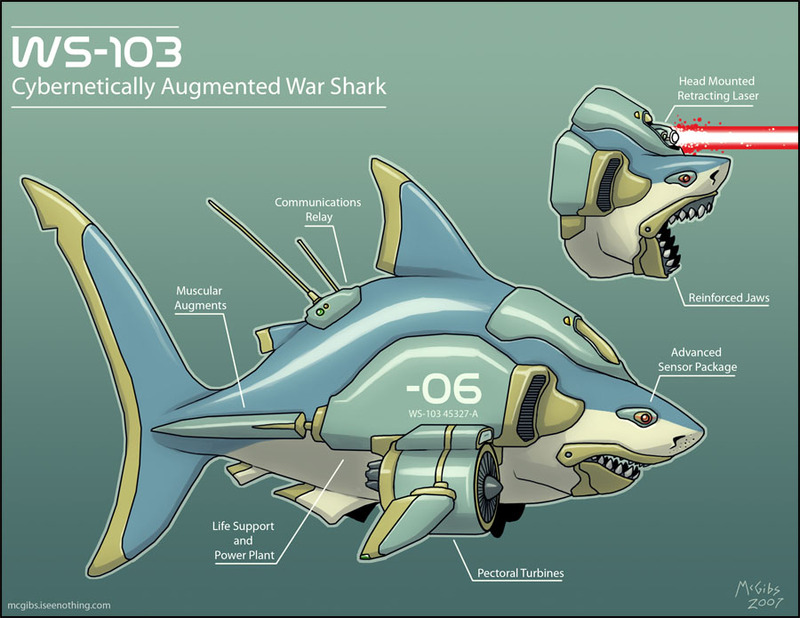 In the Austin Powers movies, sharks were unavailable and replaced with the "ill-tempered" and generally less effective "sea bass." SBSP advocates freely acknowledge these challenges exist in much the same way that scientists and engineers working on other leading edge space projects understand that they also have undefined, non-trivial engineering challenges, which are mostly dealt with during design and construction. An example of this would be the James Webb Space Telescope (JWST). But as outlined in the July 12th, 2011 post "Tracking Costs for the James Webb Telescope, the original cost of the JWST grew from $824.8Mln US in 2002 to $6.5Bln US in 2011. Since then, costs have continued to rise to the current US Congress mandated cap of around $8Bln US, as described in the November 16th, 2011 Reuters article "NASA budget plan saves telescope, cuts space taxis." Most of those increased costs were blamed on engineering challenges which developed logically from the desire of NASA administrators to make the JWST many times bigger, more powerful and more self contained than the Hubble Space Telescope, which the JWST was originally designed to compliment and later (after numerous delays) to replace. In essence, the non-trivial and undefined design challenges needing to be dealt with as part of the JWST design process introduced enough unknowns into the process so as to insure that order of magnitude uncertainties embedded themselves into fiscal estimates. Over time, the initial estimated cost became essentially the minimum cost for the project as the non-trivial and undefined design challenges turned the project into something worse that an ordinary money pit. It became an undefined and essentially bottomless one. Not explicitly defined as a money pit, but with many of the same characteristics. A Canadian firm’s technology may help ease the burden for an upcoming human expedition to Mars. Thin Red Line Aerospace, a privately-held firm in Chilliwack, BC is expected to help build an inflatable habitat for a 2018 trip to Mars planned by the Inspiration Mars Foundation. The proposed 501-day trip would send a middle-aged couple to orbit Mars without landing. Thin Red Line founder and President Max de Jong believes that even the most loving partners could find their relationship tried by a year and a half aboard a cramped spacecraft drinking their own recycled bodily fluids. De Jong sees an inflatable habitat (with its much larger space) as a means of helping them cope. Made of ultra-strong fabrics like Kevlar, the inflatable habitat would be launched on a rocket, inflated in Earth orbit, and then attached to the spacecraft. 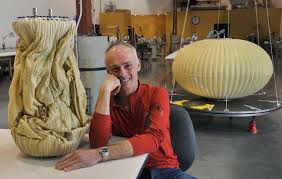 Thin Red Line Aerospace founder Max de Jong with sample habitat on the left and inflated sample habitat on the right. Photo c/o Wayne Leidenfrost PNG. Inspiration Mars did not identify Thin Red Line by name when it announced in February that the mission would include a Canadian-made inflatable habitat. However, Thin Red Line is the only firm in Canada with experience in building them. Thin Red Line Aerospace designed and built the pressure-restraining hulls for two inflatable habitats, known as Genesis One and Two, for U.S.-based Bigelow Aerospace. These units, launched in 2006 and 2007, are now orbiting Earth and serve as technology demonstrators for Bigelow Aerospace’s planned inflatable space station. Thin Red Line’s past projects have included spacecraft shielding for NASA and providing input into lunar habitat studies as a sub-contractor for Boeing. De Jong has also collaborated with Lockheed Martin Space Systems on a NASA contract to design and test a deflatable spacecraft decelerator that could slow a spacecraft’s entry into the dense atmospheres of worlds like Venus or Titan. De Jong, 52, has remained secretive about his company and has not revealed its number of employees, its revenue, or even its profitability. A veteran 36-year mountain climber, de Jong owned and operated a Vancouver, B.C-based climbing training and equipment firm called Extreme Mountain Gear from 1985 to 1990. In 1987, he became one of the first people to introduce the sport of paragliding to North America as an instructor and equipment manufacturer. Racks of high performance retail outerwear. Evidently, many of the materials used for these items, are also suitable for spacecraft construction. As part of his efforts to develop the sport, de Jong began to make lightweight harnesses for para-gliders. He diversified into other products like an emergency parachute deployment system. De Jong’s products gained a worldwide following, and eventually drew the attention of the U.S. aerospace industry. One company hired de Jong to figure out how to sew liquid crystal polymer straps for the prototype of an inflatable space craft. That project led to others of greater complexity, reflecting de Jong’s pioneering use of advanced materials such as Zylon, Vectran, and Kevlar to create inflatable space structures. In 1988, de Jong broke his spine in three places when he attempted to jump from Mount Cheam near Chilliwack, B.C in his paraglider. His paraglider, which had been improperly rigged, collapsed. De Jong fell 50 feet onto rock. Paralyzed from the waist down, his doctor gave him a 10 percent chance of walking again. In spite of this, seven months later he was back on the same mountain with two other climbers in the middle of winter. An "energy bag" developed by Thin Red Line Aerospace to store compressed air underwater, and then release it again to drive off shore wind turbines when more power is needed. Photo c/o this May 3rd, 2011 press release on the company website. De Jong launched Thin Red Line Aerospace in 2002. Besides the company’s work in human habitats and spacecraft decelerators, Thin Red Line’s R&D docket includes planetary balloons, radiation and heat shielding, orbital debris shields and inflatable antennae. Max de Jong appears to be what some consider the archetype of the NewSpace entrepeneur; the savvy, risk-taking renegade brought up in the hard school of real-world experience. De Jong has literally risked life and limb for his passions and it is those like him that will ensure the NewSpace industry stays worth watching.